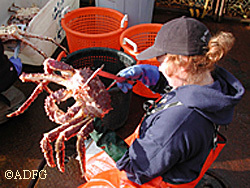 A trainee in the Crab Fishery Observer program measures a crab. ‘Observers in the Bering Sea and Aleutian Islands Crab Fisheries’ is a 24-minute information video filmed on location featuring three crab observers in their everyday duties and life at sea onboard crab fishing vessels in the commercial fisheries, collecting data for the department. The production was coordinated and funded by the State Shellfish Onboard Observer Program, and filmed and edited by the University of Alaska Anchorage, North Pacific Fisheries Observer Training Center (OTC). The release of this video production in July 2008 marks the program’s 20th anniversary. The State Shellfish Onboard Observer Program began in 1988 after the Board of Fisheries found that onboard observers provide the only effective means of collecting essential biological and management data in the crab fisheries without unduly disrupting fishing operations. Data collected by onboard observers has become an integral component in the Bering Sea and Aleutian Islands (BSAI) crab fisheries managers’ decision making process. These data are used to help characterize the fisheries, monitor bycatch, and define annual overfishing and total allowable catch limits. The video was originally developed as an aid for training crab observers; providing necessary visual examples of observer duties and working environments. Joe Chaszar (OTC observer trainer and videographer) edited and condensed the two plus hours of training video for public distribution and for use as an observer recruitment tool. Joe’s editing and choice of special effects are appropriate to the subject matter and the video’s audience, helping to move the action along without compromising but rather emphasizing important points. We are grateful for the hospitality and assistance given us by the captains and crew of the C/P Pro Surveyor and the F/V Time Bandit. Special thanks go to crab observers Steve Brown, Sara Slaughter, and Mike Todd for agreeing to be filmed. To obtain a copy of the DVD contact one of the department’s Dutch Harbor observer program office staff; Mary Schwenzfeier, Melissa Salmon, Jeanette Alas, Jennifer McGrath, or Kevin Renfro at 581-1239. For those interested in finding out more about the observer program and observer training see this following list of publications, websites, and commercial fisheries regulations. Alaska Department of Fish and Game Shellfish Observer Program. 2008. Crab Observer Training and Deployment Manual. Not published. 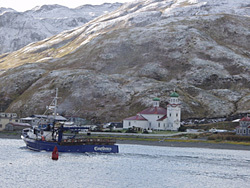 Available by request from the Dutch Harbor ADF&G shellfish observer program office, (907) 581-1239. A crab boat heads out to the Bering Sea. Barnard, D.R. and R. Burt. 2008. Alaska Department of Fish and Game summary of the 2006/2007 mandatory shellfish observer program database for the rationalized crab fisheries. ADF&G Fishery Data Series No. 08-17, Anchorage. Boyle, L., and M. Schwenzfeier. 2000. Alaska’s Mandatory Shellfish Observer Program 1988 - 2000. Pages 693 - 704. /in/ 2002. A.J. Paul, E.B. Dawe, R. Elner, G.S. Jamieson, G.H. Kruse, R.S. Otto, B. Sainte-Marie, T.C. Shirley, and D. Grant, AK-SG-01-01, Fairbanks. Schwenzfeier, M., H. Moore, R. Burt, and R. Alinsunurin. 2000. Inquiry for application of data collected by observers deployed in the eastern Bering Sea crab fisheries. Pages 537 - 550. /in/ 2002. A.J. Paul, E.B. Dawe, R. Elner, G.S. Jamieson, G.H. Kruse, R.S. Otto, B. Sainte-Marie, T.C. Shirley, and D. Grant, AK-SG-01-01, Fairbanks. Bowers, F.R., M. Schwenzfeier, S. Coleman, B.J. Failor-Rounds, K. Milani, K. Herring, M. Salmon, and M. Albert. 2008. Annual management report for the commercial and subsistence shellfish fisheries of the Aleutian Islands, Bering Sea and the Westward Region’s Shellfish Observer Program, 2006. Alaska Department of Fish and Game, Fishery Management Report No. 08-02, Anchorage. 5 AAC 39.141. Onboard observer program. 5 AAC 39.142. Conflict of interest standards for onboard observers and independent contracting agents. 5 AAC 39.143. Onboard observer certification and decertification. 5 AAC 39.146. Onboard observer briefing and debriefing. 5 AAC 39.645. Shellfish onboard observer program. 5 AAC 39.646. Shellfish onboard observer trainee program qualifications and requirements.